Excavations of Dvin, one of the largest medieval capitals of Armenia, are located about 10-12 km north from the regional capital of Artashat. The fortress-city Dvin was founded on the hill between the villages of Hnaberd and Dvin and held a very large area. 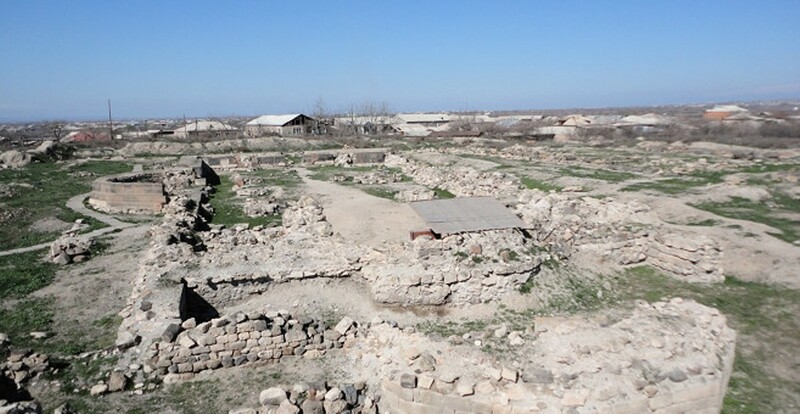 After Artashat was left without water (due to the gradual withdrawal of the channel of Araks river to the south), the hill of Dvin was elected as a new capital. In the 30-ies of the IV century enterprising king Khosrow Kotak, from the dynasty of Arshakids, built his palace here. The city quickly grew and became a prominent economic, transit trade and cultural center, that existed for almost ten centuries (until the XIII century). The majestic Cathedral (VII cent.) in the form of a high three-nave basilica was built at the site of an ancient pagan temple of the III century. The length of the cathedral was 43 m, while the width is 22 m. The picturesque carvings adorned the building inside and out. The palace of Catholicos – one of the earliest monuments of civil architecture – was built near the cathedral (in V century). Dvin was particularly known as a city of craftsmen and merchants. Expensive silk and wool fabrics, brocades, carpets, blankets, weapons – arrows and spears, swords, daggers, simple tools and military armor, as well as tools (plow blade, an ax, chisel, scissors, etc. .) were produced in numerous workshops of the city. Dvin endured all the hardships that Armenia had to go through in the middle of the century. After the fall of Arshakid dinasty in 428, the city became the seat of marzpens – Persian rulers of Armenia. In 640 the city was taken by the Arabs, and the caliphate has made it the center of one of their emirates – “Armenia”. The city survived until 1236, when it was finally destroyed by the Mongols, who ruthlessly cut out almost all the inhabitants. Dvin was desolated, covered with a thick layer of dust and earth and was forgotten.